The twisting, hilly streets of San Francisco are difficult enough to navigate without having to worry about a parking problem. Unfortunately for San Francisco residents, a parking crunch is exactly what's happening. The city's doing what it can to alleviate the problem, and that includes a $95.5 $23 million program called SFPark that will convert 6,000 of San Francisco's 24,000 metered parking spaces into "smart" spots. These special parking spots are currently being fitted with sensors that will allow drivers to find available spaces over a city-wide wi-fi network. The network will show available spots on drivers' cell phones and on dynamic street sign displays. It seems like a great idea, which led us to ask why there aren't more of these systems being deployed across the US already. 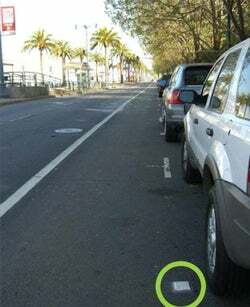 The SFPark network is also adapable to parkers' habits. If a resident wants to add more time to the meter, they won't have to return to their car to do so, and spots can be calibrated for longer evening parking stays as well. The battery-powered sensors, manufactured by Streetline Industries, are good for 5-10 years before they need to be replaced.